Gastric bypass surgery is one of the most common weight loss surgeries and it features two major parts. The first part entails the surgeon dividing the stomach into one small portion and one large portion. Next, the small portion is stapled or sewn to resemble a pouch that can hold a small cup of food. This procedure is known as stomach stapling. The second part involves the surgeon disconnecting the small or the new pouch in the stomach from the stomach and the small intestine while connecting it to a part of the small intestine. This procedure is known as Roux-en-Y. 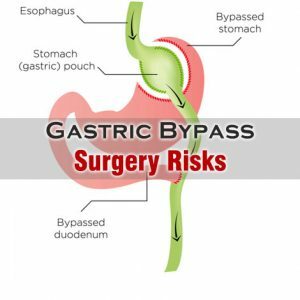 As with all the other surgical procedures, there are certain gastric bypass surgery risks involved, which you need to be aware of beforehand. This is quite common post gastric bypass surgery. However, this problem can effectively be handled by consulting a doctor. It is recommended to avoid granular fiber as it can result in obstructions. These are also very common with gastric bypass surgery risks because an individual loses weight at a very fast pace. However, it is to be noted that gallstones are generally harmless and they might only cause abdominal pain, vomiting and nausea. If these conditions get serious, it becomes necessary to get the gallstones removed. This happens in people who get into the habit of eating meals high in sugar post gastric bypass surgery. Fruit juices and sodas are some drinks that need to be completely avoided. This is because they are sugary and they might cause weakness, vomiting and nausea in the patients. It has been reported through studies that gastric bypass surgery can cause hypoglycemia complication which requires immediate treatment. Such patients might get easily confused and blacked out making automobile collisions quite common. The death of a person is one of the most common Gastric bypass surgery risks. It has been evaluated through research that death following gastric bypass surgery is higher and this also goes for the younger patients.